Visit Texas eBird to find out what's being reported. Eubank Woods is an eBird hotspot. 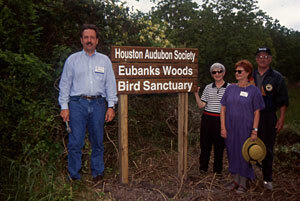 Purchased by Houston Audubon with funds from the National Fish and Wildlife Foundation, this 9.5-acre sanctuary of woods and wetlands was named in honor of Ted Eubanks, a past president of the Houston Audubon Society who was instrumental in starting Houston Audubon's High Island sanctuary system. It is open to the public sunrise to sunset year round.